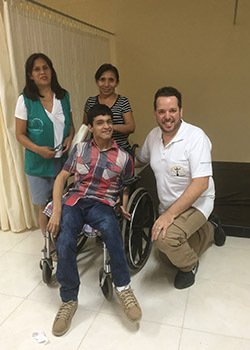 Since 2005, Tomas Eberle, PT, DPT, a faculty member on the Miami campus, has been traveling to a remote area of Peru to treat patients from local villages and teach aspiring physical therapists. Although there are universities in the capital of Lima that offer advanced medical education, they are not accessible to many people living in rural areas. During the summer, Eberle teaches at a modest satellite campus of Sedes Sapientiae Catholic University. He is one of several specialists who travel from Lima and the United States to teach in specialty areas. For Eberle, the focus is orthopaedics. Classrooms are just open space with desks. No equipment. No air conditioning. Because textbooks are so dated, students rely on lectures from professors. Eberle teaches half the day and treats patients the other half with cohorts of students and 15 recent graduates. The medical mission is organized by the church. Demand is so high from the 2,800 villages in the 20 to 30 square miles around the school and hospital that the church hands out tickets to the neediest. Even then, they often wait four to eight hours to be seen.